For most of the year, the 3 Ravens barrel farm most often sends out soured, mixed fermentation beers into the world. But the brewers play around with oak in different ways too, with winter 2018 giving them the opportunity to release a trio of a rather larger, maltier nature. One of them will be familiar to many beer fanciers: the 2018 vintage of Druid. The beer started out as then head brewer Adrian McNulty's attempt to recreate (rather successfully, as it turned out) Pedro Ximenez in beer form. The beer has returned annually since, retaining the same essence while being tweaked a little around the edges. This year's release spent time in freshly emptied whisky barrels. The former remnants do their best to catch your attention, but they're in for a challenge, set against such a mountainous, sticky 12 percent ABV beer in which you'll meet intensely rich chocolate syrup, cola, dark fruits, vanilla, marzipan, molasses and more. Joining Druid is a pair of beers sporting a new, glittery look. One is the Barrel Aged Imperial Stout. It's the biggest of the three, at 13 percent ABV, and was aged in former Starward Whisky casks. As well as the blend of speciality malts and English yeast, they added a high gravity yeast/enzyme mix they used in a (Brut-esque) imperial IPA in summer to create a beer featuring plenty of chocolate flavours, some nuttiness and an earthy underbelly, with a rummy booziness running through its midst and Amaretto and fruity dark espresso aromas completing the picture. 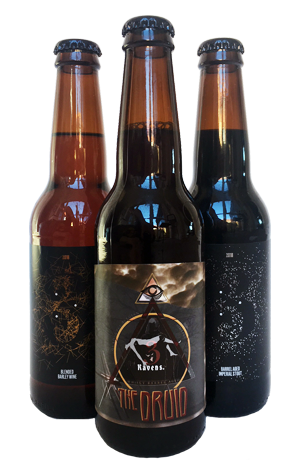 The baby of the three – a mere 10 percent ABV – is the Blended Barley Wine, the second entry in a series that started last year and sees a little of the previous year's beer (which itself featured a house stock ale from 2011) blended in Solera style. Add in some house malted barley and Balgownie shiraz barrels and you have quite the recipe. For all that, this is more to style as a barley wine than last year's vintage, with hints of rose atop the orange marmalade and toffee malt aromas, a rich sweetness on the palate, a drying bitterness and some prickly warmth too.